The average annual bycatch rate of pinnipeds and cetaceans in the U.S. from 1990 to 1999 was estimated at 6215 animals with a standard error of 448. The fisherman bycatch issue originated due to the "mortality of dolphins in tuna nets in the 1960s". Additionally, the term "deliberate bycatch" is used to refer to bycatch as a source of illegal wildlife trade (IWT) in several areas throughout world. Shrimp trawl fisheries catch 2% of the world total catch of all fish by weight, but produce more than one-third of the world total bycatch. American shrimp trawlers produce bycatch ratios between 3:1 (3 bycatch:1 shrimp) and 15:1 (15 bycatch:1 shrimp). Of the 21 albatross species recognised by IUCN on their Red List, 19 are threatened, and the other two are near threatened. Two species are considered critically endangered: the Amsterdam albatross and the Chatham albatross. One of the main threats is commercial long-line fishing, because the albatrosses and other seabirds which readily feed on offal are attracted to the set bait, after which they become hooked on the lines and drown. An estimated 100,000 albatross per year are killed in this fashion. Unregulated pirate fisheries exacerbate the problem. Bycatch is inevitable where there is fishing activities. The incidental catch is not limited to only fish species: dolphins, sea turtles, and seabirds are also victims of bycatch. Longlines, trawls and purse seine nets are driving factors in the endangerment of no fewer than fifteen shark species. Bycatch may also affect reproduction of populations as juveniles are also victims of bycatch. Bycatch happens most commonly with the use of gillnets, longlines, or bottom trawls. Longlines with bait hook attachments can potentially reach lengths of dozens of miles, and, along with gill nets in the water and bottom trawls sweeping the sea floor, can catch essentially everything that swims by and which is in their paths. Currently in the world, there are thousands of miles of different types of nets and lines being put into world’s ocean daily, and these modern fish gear are robust and invisible to the eye, making them efficient at catching fish and bycatching everything else that comes in the way. One solution that Norway came up with to reduce bycatch is to, "adopt a 'no discards' policy". This means that the fishermen must keep everything they catch. This policy has helped to, "encourage [bycatch] research", which, in turn has helped "encourage behavioral changes in fishers" and "reduce the waste of life" as well. Seabirds get entangled in longlines by flocking around vessels, this eventually leads to drowning because they try to catch baits on the hooks. Fisheries had been using “Streamer lines” as a cost-effective solution to mitigate this type of bycatch, and it has dramatically reduced seabird mortality. These streamer lines have bright colors and are made of polyester rope, they are positioned alongside the longlines on both sides. Their bright colors and constantly flapping of water frightens the seabirds and they fly away before reaching the baited hooks. A successful example would be the use of streamer lines in Alaskan groundfish longline fisheries, as the deaths of seabirds declined by about 70% after the employment of these lines. ^ OECD (1997) Towards sustainable fisheries: economic aspects of the management of living marine resources. OECD Paris. ^ C. Michael Hogan. 2010. Overfishing. Encyclopedia of Earth. National Council for Science and the Environment. eds. Sidney Draggan and C. Cleveland. Washington DC. ^ Read, Andrew J.; Drinker, Phebe; Northridge, Simon (February 2006). "Bycatch of Marine Mammals in U.S. and Global Fisheries". Conservation Biology. 20 (1): 163–169. doi:10.1111/j.1523-1739.2006.00338.x. ^ Hall, M. A., Alverson, D. L., & Metuzals, K. I. (2000). By-catch: problems and solutions. Marine Pollution Bulletin, 41(1), 210. ^ Hall, M A (1996). "On bycatches". Reviews in Fish Biology and Fisheries. 6 (3): 319–352. doi:10.1007/BF00122585. ^ Ermolin, Ilya; Svolkinas, Linas (January 2018). "Assessment of the sturgeon catches and seal bycatches in an IUU fishery in the Caspian Sea". Marine Policy (87): 284–290. ^ Clucas, Ivor (1997). Discards and bycatch in shrimp trawl fisheries. FAO Fisheries Circular. ^ Hall, M; Alverson, DL; Metuzals, KI (2000). "By-catch: problems and solutions". Marine Pollution Bulletin. 41 (1–6): 204–219. doi:10.1016/S0025-326X(00)00111-9. ^ Morgan, LE; Chuenpagdee, R (2003). Shifting Gears. Addressing the Collateral Impacts of Fishing Methods in U.S. Waters. ^ Clucas, I.; Teutscher, F., eds. (1999). FAO/DFID Expert Consultation on Bycatch Utilization in Tropical Fisheries. Beijing (China), 21–28 Sep 1998. University of Greenwich, NRI. p. 333. ISBN 978-0-85954-504-4. ^ Gulf of Mexico Red Snapper: Assessment Summary Report (PDF). Southeast Data, Assessment, and Review (SEDAR) Stock Assessment Report of SEDAR. 2005. ^ Demaster, DJ; Fowler, CW; Perry, SL; Richlen, ME (2001). "Predation and competition: the impact of fisheries on marine mammal populations over the next one hundred years". Journal of Mammalogy. 82 (3): 641–651. doi:10.1644/1545-1542(2001)082<0641:PACTIO>2.0.CO;2. ^ IUCN, 2004. Red List: Albatross Species Archived April 27, 2006, at the Wayback Machine. Retrieved July 27, 2007. ^ Brothers NP (1991). "Albatross mortality and associated bait loss in the Japanese longline fishery in the southern ocean". Biological Conservation. 55 (3): 255–268. doi:10.1016/0006-3207(91)90031-4. ^ a b c "Effects of Bycatch from Fishing for Wild Seafood from the Seafood Watch Program at the Monterey Bay Aquarium". 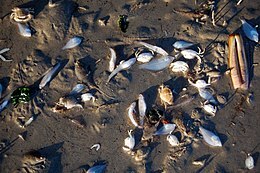 www.seafoodwatch.org. ^ "Bycatch - Threats - WWF". World Wildlife Fund. ^ "Final Amendment Number 13 to the Fishery Management Plan for the Shrimp Fishery of the Gulf of Mexico" (PDF). US Waters with Environmental Assessment Regulatory Impact Review, and Regulatory Flexibility Act Analysis. 2005. ^ Hall, M. A., Alverson, D. L., & Metuzals, K. I. (2000). By-catch: problems and solutions. Marine Pollution Bulletin, 41(1), 207. ^ "Bycatch, ethics and pitfall traps". Journal of Insect Conservation. 3 (1): 1–3. 1999. doi:10.1023/A:1017191920328. ^ Kranz A, Polednik L and Gotea V (2001) Conservation of the European Mink (Mustella lutreila) in the Danube Delta Archived 2011-09-29 at the Wayback Machine Background information and project plan. Scientific Annals of the Danube Delta Institute for Research and Development, Tulcea, 2000–2001.